I’ve been complimenting people more often lately. I’m not sure how it started or why, but if I like the cashier’s braids or the barista’s necklace I have been saying so out loud instead of keeping these thoughts to myself. And my natural instinct is definitely to keep it to myself. I do not go out of my way to engage people in real life, which is probably why it’s easier for me to make online friends than real-life friends. I know that I should be friendlier and talk to the people around me about the weather or the cute dog they are walking or whatever, but dude, it’s so not me. When I moved to my new apartment, I told myself I should be friendly and introduce myself to everyone I saw coming and going. Make new friends, Jennette! New friends! This lasted for about a week until I reverted back to the murmur-hello-and-avoid-lingering-eye-contact mode that I’m usually in. I wish I were one of those people who find it easy to talk to anyone and everyone, but I am not. I’m more like my cat, Java Bean, who runs to hide under the bed whenever someone who isn’t me stops by. I seem to be ok giving people compliments though. I still have to deliberate for a few seconds about it, as if it requires great courage to speak to a stranger. Should I tell her that her tights are cute? Should I? Ok, I’ll do it! I figure everyone likes getting compliments, so it’s a low risk exercise. I vividly remember compliments I’ve gotten, like the lady at the coffee shop who liked my red sneakers and the checkout lady at the grocery store who liked my gray top with the zippers on the shoulders. Tell me I am pretty and you are so totally my new best friend. I’m so easy, it’s disgusting, really. The key is to be sincere. Don’t say something unless you genuinely mean it. I also figure, why keep nice thoughts to yourself? There’s a lyric in an old Ben Folds Five song, The Last Polka that goes, “The cruelest lies are often told without a word/The kindest truths are often spoke and never heard.” I wouldn’t say it’s a cruel lie not to tell the barista you like her necklace, but there’s no real reason to keep it to yourself. So why not say a kind truth and let it be heard? I don’t honestly remember how I was turned on to your website – then PastaQueen, but I started reading and was hooked. Being challenged with weight issues myself, I picked up a copy of Half-Assed – and couldn’t put it down. (I LOVE the name of the book – why I stick around your blog – because we share the same sense of humor.) When I tore through Half-Assed, I HAD to get Chocolate & Vicodin. I did not share the same understanding of your headache health as your weight journey, but I enjoyed it just the same. (Is it wrong to say that you enjoyed hearing a tale as horrible as yours – the headache that wouldn’t leave?) I’ve since recommended that book to several people who do suffer from chronic headaches if for nothing then to know that there are others out there like them. I don’t feel like I’m making much sense (it’s early, the caffeine hasn’t kicked in yet) but I thing your writing is amazing – humorous, insightful and helpful to many people as well. Keep on doing what you’re doing – I just wanted to pay YOU a compliment today, too. Hopefully you’ll remember me as the woman that at the first fitbloggin told you that you were the reason I started blogging. Here I am 4+ yrs still doing it and still grateful 🙂 I too try to dish out compliments as often as possible. Glad you’re still here and I’ve been enjoying your daily posts 🙂 I got to missing you. Ok, I swear I did not write this post to fish for compliments, and I didn’t even predict that’s what would happen. But thank you for all the kind words! I enjoy giving compliments randomly as well! Usually you can really you’ve made a person’s day, which is an awesome feeling. Also, they can occasionally be self-serving. Example: told the girl in line in front of me at Target that I loved her sandals; found out where she bought them, and got myself a pair too! Win-win. @Jen in MN – that should say “usually you can really TELL.” Oops. My typing is getting pretty horrible these days! This is something I need to work on. I get all shy, and I’m scared of sounding fake and gushing. Why is it so hard to compliment someone!? And I don’t even just mean strangers, I even find it hard to compliment my friends and family. My worst problem is if someone has just complimented me I feel like if I say something nice back they will think I only said it because they did … I think I am overthinking this! My project for the day — say something nice to at least every second person I interact with. I work from home so it won’t be many people, but I’m sure I can find someone. My husband, at least! I don’t compliment him nearly enough. Damn, I was just interrupted by a phone call, someone calling me back to book me in for an information session. She was very helpful, telling me how to find the room and giving me information about another session I might like, and I didn’t say so! I said thank you but not something like “you’ve been really helpful”. That means I have to compliment the very next person for sure. I’ve embarked on the exact same “Say Something Nice” program over the past several years. 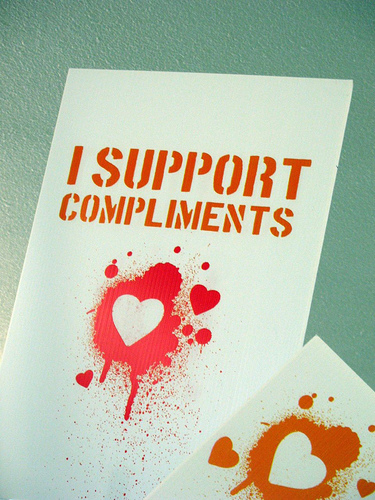 Like you, I am still somewhat mystified as to exactly why it’s so hard to pay someone a compliment. I can be looking right at a friend thinking “Wow that is a really cute haircut,” yet somehow, it never comes out of my mouth. So I decided to put some conscious effort into saying a kind word. I can’t say I’ve scored 100% on this campaign, but I am doing better. As a companion piece, I’ve also started trying to say when I feel good, or when something makes me happy. I’m not trying to be Pollyanna (who would get on my last nerve), but I know I can be quick to complain sometimes so it’s only fair to be as quick to recognize when something went well. Jennette, I know you’re not fishing for compliments, but your blog was one of the first I followed consistently and couldn’t wait to read. I am so glad you’re posting regularly! When we moved into our apt. building, I too made an effort to introduce myself to everyone I met…until I introduced myself to someone in the elevator and they said “Uh, I’m just visiting someone here.” A little over zealous maybe! This is SO ME! I’m good at making friends on the Internet. I’m so thankful for the invention of Facebook and e-mail. I can communicate so much better that way than face to face or even on the phone! I hesitate to approach people, and yet as you do, remember every compliment I ever received from a stranger. So….I’m resolving right now….give out those compliments to one and all. Why keep that good stuff to yourself? When I substitute teach, I never approach the other teachers in situations where we are together, like on the playground, presentations, etc. I should. Just walk up and say HI and introduce myself. I just can’t make myself do that. Shyness is a curse. If only I could just email them??!! I am a murmur and avoid eye contact type as well. My boyfriend knows all our neighbors who greet him by name when they see him, I on the other hand have to be reintroduced when we run into people when we are together. But I do try to do complimenting, especially for the middle school kids I work with. Such a horribly awkward age and they just glow after hearing something nice. I am so enjoying the wide variety of topics in your October posts. I hope you will keep up with frequent posts even in November.